Thyme apartment is a lovely space, it has a vintage feel with a modern touch, spacious living room and two bedrooms with separate bathrooms. 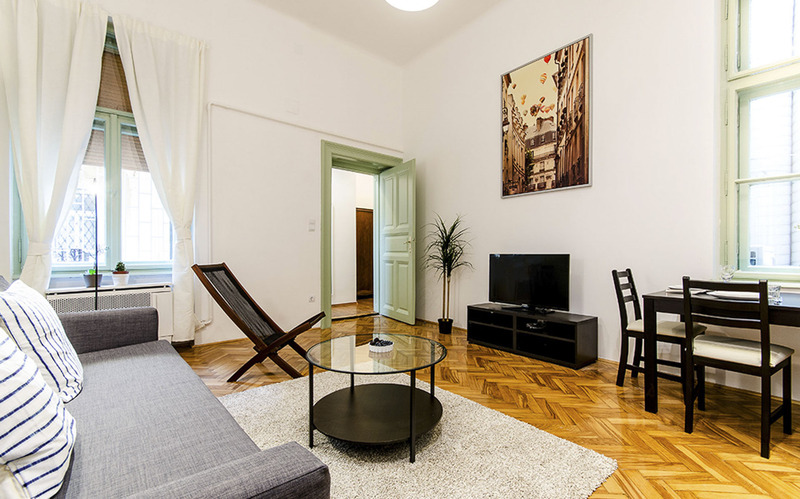 The apartment is situated in downtown Budapest, so everything is walking distance. It is at one of the most important public transport junctions in the city, so it has great public transport connections, but it is in a quiet courtyard, which ensures you have a perfect place to rest during your holiday. Living on one of the most important avenues has many advantages. In 5 minutes walking you can find nice cafés, restaurants, some famous clubs, museums, supermarkets, the biggest shopping centre of Budapest, and also parks, playgrounds and a small market. Thyme apartment has the perfect location for sightseeing and nightlife too. It is close to the river, so in 10 minutes walking you can enjoy one of the most beautiful views in Budapest. The closest sights are the Parliament, the Opera and St Stephens Basilica, both 5-10 minutes walking away.